News in overnight from Josh Gulbranson and Stuart Larsen at Fraser Yachts in Fort Lauderdale that their joint listing, the 73.15m motor yacht Laurel has had a price change from Euros to US dollars. Built by Delta Marine in 2006, Laurel has generous accommodation for 16 guests in a master suite with private deck, plus four double staterooms and a twin cabin. 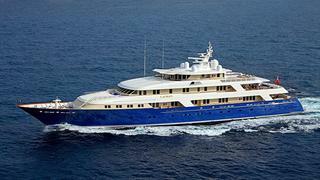 Previously asking €62.5 million Laurel is now on the market asking $85 million.